"Divad's Chagrin" is an epic poem of the Redguards describing the great hero's remorse at forsaking the life of a musician to fight tyranny and injustice. No one seems to know what the story of Divad has to do with this shallow mine in the desert. 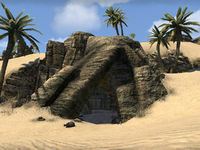 Divad's Chagrin Mine is a mine in central Alik'r Desert, southeast of Sentinel containing goblins. 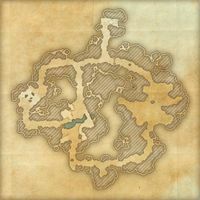 It is inhabited by feral Sandgrubber goblins. The Towers' Fall : Step out of time in order to save the very fabric of Creation. Divad's Chagrin Mine Wayshrine is located south of the mine, near the main road to Bergama. This page was last modified on 7 December 2018, at 03:33.